While you are sealing ducts, you may want to consider having a heat audit of your home.You can find out where heat is leaking out, and seal the gaps. This, too, will help your furnace and air conditioner to run more efficiently and use less power - which also means that you will save money. Some communities offer free heat audits of homes in the fall - if your community is one of them, be sure that you take advantage of this service. When you upgrade your appliances, do your homework and buy the most energy-efficient models you can find. If you are looking for a new furnace, see if you can find one that has an AFUE (Annual Fuel Utilization Efficiency) rating of at least 80, and preferably more than 90, percent. For an air conditioner, try to find one that has a SEER (Seasonal Energy Efficiency Ratio) of at least 14. If your furnace or air conditioner is not very old, though, don't bother - wait a few years until technology has made even more energy-efficient appliances a reality. Conserve water. Check for leaky pipes that can be fixed, use low-flow aerator heads on faucets, and use a low-flow toilet (or modify existing toilets by adding an empty milk jug full of gravel to the toilet's water tank). Use recycled or sustainable materials if you are replacing cabinets or countertops in your kitchen. Try to find cabinets that are made out of compressed agricultural plant material, such as wheatboard or strawboard, instead of particleboard or fiberboard. Better yet, don't replace the internal shelves and drawers in your kitchen at all - replace only the fronts. If you need to replace flooring, consider using natural flooring. One good option is cork, which is a good choice for allergy sufferers, is easy to install yourself, and also provides you with a floor that is both quiet and beautiful. Perhaps you can't afford solar panels for your house - but you might be able to manage outdoor solar lights that charge during the day and go on automatically in the evening when the sun goes down. Some people say that composting is the new recycling. Adding a composter to your kitchen can provide you with a way to recycle your kitchen scraps and have a ready source of soil for your gardening projects at any time - it's really a win-win situation, if you have the space for it. When you remodel, if you can downsize your home instead of upsizing it, take the opportunity to do so. Find ways to live in less space, or let some rooms do double duty. A Murphy bed (a bed that folds up onto a wall) can be used to convert a home office to a spare bedroom, for example. Or, alternatively, reduce the amount of space in your home that is climate-controlled. Set up your home so that the spare bedroom your college student uses in the summer doesn't have to be heated in the winter, for example. Remodeling a home can be expensive. Take some time to talk to a contractor who has done green remodels before about options for greening your home without going over budget on your project. Choose the greenest versions you can of the things that you are certain you need to replace - and don't worry about not being able to afford to do everything. You're only human. George Rollins is a home enthusiast at FurnaceCompare.com, a site that not only has extensive information on furnaces, boilers and air conditioners, but also includes consumer reviews and tips on choosing HVAC contractors. George has a passion for educating consumers on home renovation and improvements, as he feels that the right information helps consumers choose more wisely. It is the first Friday of the month and that means it's time to head to the kitchen for another delicious vegan dish. If you've been following this blog for any length of time, then you know that we promote meatless meals as one of the easiest ways to walk a little gentler on the earth. Putting it briefly, it takes less natural resources to produce one pound of plant-based foods as opposed to the same amount of animal-based foods. If you're thinking that a meatless meal is boring and nothing more than "rabbit food" on a plate ... you're in for a pleasant surprise! This month's recipe comes from another of my favorite sites: Live. Learn. Love. Eat. Tiffany, author and "chef extraordinaire", shares wonderful vegan recipes such as Cinnamon Pumpkin Pancakes and Veggies Love Macaroni and Cheese. Her recipe page is sorted by meal and each recipe includes easy-to-understand instructions, pictures (even some of her adorable children) and stories. On another page, Tiffany shares information about the ingredients she uses in her recipes. Not sure what nutritional yeast is or how to use Chia Seeds? No problem ... she's got it covered. Live. Learn. Love. Eat. is a friendly, warm site ... and a wonderful cooking resource. Tiffany has graciously agreed to share a recipe with us today. I hope you'll give it a try. In a skillet heat the olive oil on medium heat and add the garlic. Saute the garlic until it becomes fragrant. Add the onion to the skillet and cook until translucent. Add the chopped zucchini and pepper to the onion and garlic along with the Italian seasoning, sauteing a few minutes more, until the vegetables become soft. Add the pasta sauce, cooked brown rice and black beans. 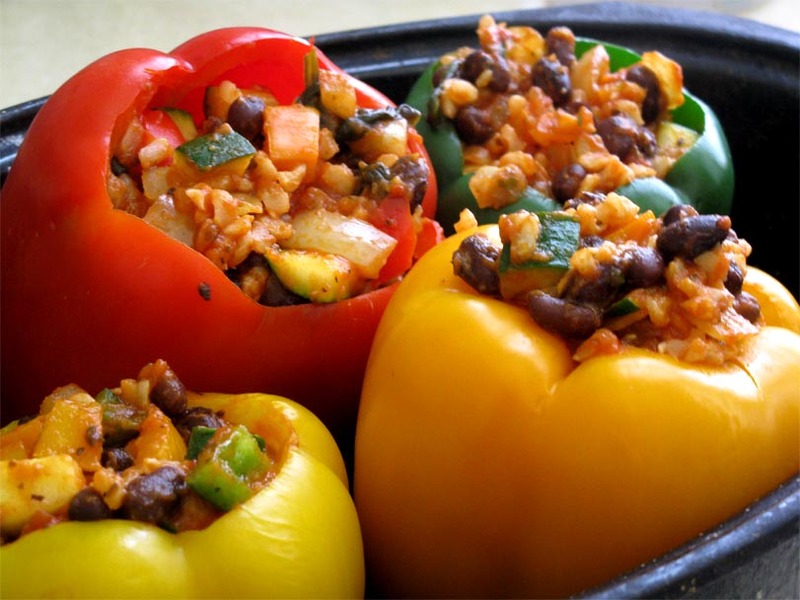 Cook until mixture is hot, reduce heat to low and prepare the peppers. Bring a large pot of water to boil. Cut the tops off of the 4 large bell peppers, rinse and take out the seeds. Blanch the peppers in the boiling water for a few minutes, watching them carefully. You do not want them to get too soft or they will not stand. Preheat the oven to 350F. Stand the blanched peppers up in a baking dish and stuff them with the Italian bean/rice mixture.Top with grated soy mozzarella cheese if desired and bake for 10 minutes. Broil the peppers for the last few minutes of the baking time if using cheese, until the cheese is melted. Doesn't that sound great? I'd to thank Tiffany for that wonderful recipe and I encourage all of you to visit her site and browse around. One warning, however ... her site will definitely make you hungry!